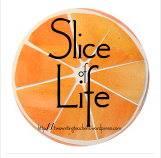 Every Tuesday, the inspirational writers of Two Writing Teachers host Slice of Life. All are welcome to participate by linking up posts or commenting on other participants. Yesterday, according to my daughter and her friends, was Senior Skip Day. (I hesitate to capitalize that term, as it seems to formalize and sanction it! I have to admit that I secretly approve of the tradition...) My daughter couldn't skip the whole day if she wanted to play in her tennis match, so, long story short, I ended up driving to Manhattan to pick her up on Sunday night. Many people heard that I was driving the two hours to New York and turning around to drive home, and they thought I was either nuts or a really good mom. I'm probably a little of both, but there was something else going on for me when I said yes to picking her up. I wish I could give credit to the person who taught me the difference between saying "I have to" and saying "I get to." That one word substitution is a huge perspective changer. I didn't have to pick up Julia; I got to pick up Julia. My ride in became an opportunity to have some really treasured conversations with friends, and the ride home was full of Julia's stories of the day with friends in New York, as well as important reflections on how it feels to be an almost-high school graduate. How many times do we get focused time with our 18 year-olds? This slight change in semantics is a major change in my approach to life. Try it. It's not that I have to write those curriculum maps--it's that I get to. I still needed to bribe myself with some chocolate at the end of lesson sequences, but I'm reminded that the work I do is important and matters and is a privilege that has been entrusted to me. I get to write those plans, I get to order those books... I might argue about getting to do the dishes or fold the laundry... In any case, it's a substitution that has been really important in my work at school and at home. The words are small, but the difference is huge. There is so much to love about Counting Thyme by Melanie Conklin. Thyme and her family move from San Diego to New York City in order to get cutting edge cancer treatment for Thyme's younger brother, Val. Thyme has to deal with moving, fitting into a new school, figuring out a grumpy neighbor, sharing a bedroom with a moody older sister... While the primary focus is on Thyme and her issues, all of the characters are multi-dimensional and provide discussion opportunities about all sorts of social issues. The basic premise is simple in that Thyme has to establish a new identity and set of friends while supporting her brother and coping with the understandable family tension. However, perceptive readers will find a lot of other issues to talk about if they pay attention to the struggles of many magnetic characters. 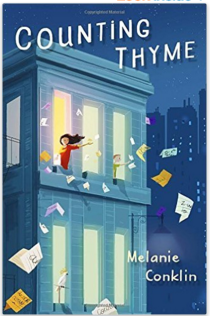 Melanie Conklin weaves in loneliness, insecurity, loss of parents, grief, immigration, even dementia, as there is an unlikably likable neighbor who both fascinates and scares Thyme--and she does this all while maintaining a strong middle school voice and perspective. I'm really looking forward to hearing other people's reactions to this new book! My percolation about the craziness of May turned into somewhat of a poem. I wasn't expecting that! Ask someone "How are you?" Maybe there's time to answer. Maybe there's time to hear the response. Celebrations and promotions and graduations and tournaments. And we still need dinner and snacks and homework help and sleep. I spent some of the rest of my walk worrying about one of my daughters might have ordered that I said yes to and didn't remember. I didn't need to worry! When I got home, my package of books had arrived that I won from my participation in the Slice of Life Challenge. Thank you Two Writing Teachers, and thank you Little, Brown Books for Young Readers! Mama Seeton's Whistle by Jerry Spinelli would have been an amazing Mother's Day gift, as it really is a tribute and statement about the power of a mother to bring her family together. Far from a small moment story, it spans the life of a family, celebrating the moments of growing up and the power of family dinner and chocolate cake. Love, love, love this book. 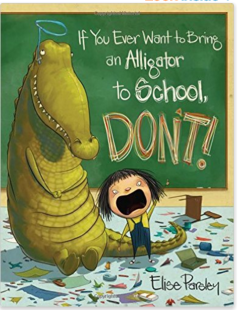 If You Ever Want to Bring an Alligator to School, Don't! by Elise Parsley is hilarious. While it's not one that easily fits into a narrative unit, it's a book that students, young and old, will really enjoy. Despite her better judgement, Magnolia brings her alligator to school for show-and-tell (even though she knows that she would be better off with "a hollow stick, or a bird's nest, or some sparkly rocks.") Throughout the day, she has to live with the consequences which include her name on the board with checks and underlines and a potential visit to the principal. 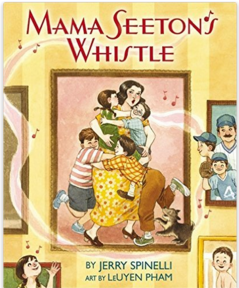 It's a great book for teaching about endings, voice, and details. 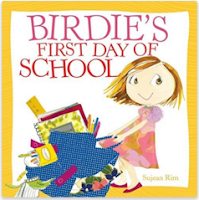 Birdie's First Day of School by Sujean Rim is a great book for early primary teachers to read on the first days of school, but it is also a great mentor text for teaching about narrative craft moves. Birdie is predictably worried about the first day of school, and she does some talking with her monster about that, some inner thinking to herself, and goes through a lot of nervous behavior. There's easy to follow time transitions, as well as repetition, character development, and setting description. 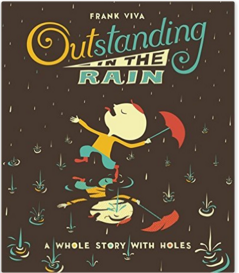 Outstanding in the Rain by Frank Viva is almost too clever to describe. The book has holes which reveal letters on the following page. It makes sense on the first page, and then rhymes and completes a thought on the next page. It's not a mentor text because what Viva has done with word play is far too tricky to be duplicated. However, it would be a great class challenge to try to predict what might come on the next page, and it would be extremely fun to try to create a classroom version. 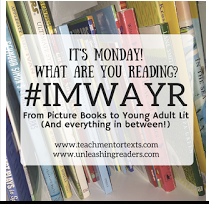 So happy to be reading today!